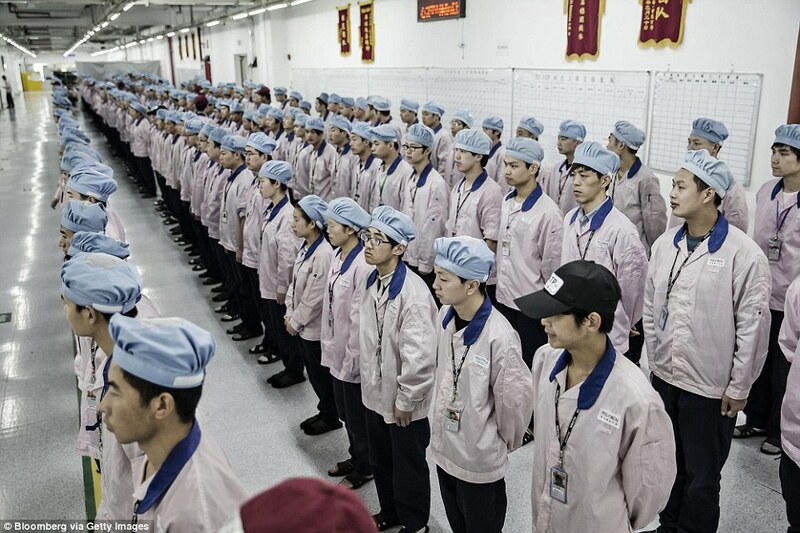 Lined up with military precision, hundreds of employees wait to make iPhones at one of the most secretive factories in the Apple production line. Dressed in pink jackets, blue hairnets and plastic slippers, the workers have their ID badges scanned on an iPad by a supervisor at morning roll call. From there, they make their way in single file to the assembly line but not before undergoing facial recognition checks at security turnstiles to clock in. Pegatron Corp employs up to 50,000 people to assemble iPhones at its plant in Shanghai which covers an area the size of 90 football fields. For five days last week, the confessions poured forth from Chinese human rights activists and attorneys rounded up last summer and held incommunicado for a year. Four men, facing trial for subversion, cowered before a court where they were represented by lawyers they didnâ€™t choose. A fifth person, knowing her husband was detained and teenage son under surveillance, declared her wrongs in a videotaped interview. China is in the midst of what many overseas scholars say is its harshest crackdown on human rights and civil society in decades. Since Xi Jinping came to power nearly four years ago, hundreds of activists, lawyers, writers, publishers and employees of nongovernmental groups have been rounded up. Many more have been threatened and intimidated. Internet news sites have been ordered to stop publishing reports from sources that arenâ€™t sanctioned by the state. Even as China has been touting its efforts to boost the â€œrule of law,â€� some critics of the government have vanished under mysterious circumstances in places like Thailand and Hong Kong, only to surface months later in Chinese custody, claiming rather unbelievably they had turned themselves in voluntarily. Many of those detained have appeared on state-run TV confessing to crimes before they have had a day in court. Last fall, then-British Prime Minister David Cameron said ties with Beijing were entering a â€œgolden era.â€� In Paris in December, Xi won praise for helping broker a global climate change pact. And next month, China will host President Obama and other leaders at the G-20 summit in Hangzhou. Meanwhile, Chinese companies are buying European soccer teams. Chinese directors are shooting films for Hollywood studios and Disney has just opened a $5.5-billion theme park in Shanghai. Record numbers of Chinese students are studying at U.S. high schools and colleges. While Chinaâ€™s crackdown on domestic dissent has yet to cause major international discord, that could change soon, predicted Shirk. The Chinese and the West, she said, may find themselves in a â€œglobal contest of ideologiesâ€� just like the Americans and Soviets once did. â€œWhat Xi Jinping is doing is, heâ€™s really stirring up a Cold War mentalityâ€¦. Youâ€™re either with China or against China â€” and Western values, universal values, are against China,â€� she said. Gordon Chang: China?s Muslims Are ?Dying In Internment Camps? Gordon Chang, columnist and author of The Coming Collapse of China, joined SiriusXM host Alex Marlow on Monday?s edition of Breitbart News Daily to talk about China?s systematic persecution of its Uighur Muslim community. ?China has detained probably around a million Uighurs, who are the Muslims in northwestern China. They?re being detained not because of crimes they?ve committed, but because they are Muslims,? Chang explained. ?Beijing has an anti-religion policy generally, but it?s been applied the harshest against the Tibetans in southwest China and the Uighurs in northwest China,? he observed. ?These are crimes against humanity, against the Uighurs,? he charged. ?Clearly we need to do something about it, because people are dying in these internment camps.? ?The world has, up till now, not known very much about it, and therefore has not paid much attention. Now we do know something about it, and we do need to impose costs on Chinese leaders ? high leaders and lower officials who have been responsible for this. I don?t think that we should ever allow a Chinese leader to have a state visit to the U.S. while these internments continue,? he recommended. China?s state-run Global Times argued on Monday that most Chinese people ?laughed? at Mihrigul Tursun, a Muslim Uighur woman who revealed last week she had suffered beatings, electrocution, and the killing of her infant child in an internment camp set up by Beijing. China has denied assertions by the United States and United Nations that Beijing has forced up to one million Muslim minorities ? mainly Uighurs but also ethnic Kazakhs and Kyrgyz ? into an estimated 1,200 mind-transformation centers, also known as concentration camps, where the prisoners face systemic torture, disappearances, executions, and arbitrary detentions, among other crimes. Beijing claims the facilities, located in Uighur Muslim majority-Xinjiang province, are vocational and educational centers aimed at combatting terrorism and religious extremism. Several former re-education camp prisoners have accused authorities of torture. China is following the path that Japan took in the years leading up to the bombing of Pearl Harbor 77 years ago. Of course, China has been much more subtle, but no less aggressive. Indeed, the outcome may be worse. In the year (1918) immediately after the First World War, a war in which Japan was a member of the winning alliance, the Japanese expected to take their place on the world stage as a major player. They were awarded many of the formerly German territories in the Pacific, but they demanded more. They demanded the formerly British and American markets in China. The Chinese resented both Britain and the U.S., but when the Japanese military arrived, the Chinese wisely allied themselves with their former oppressors and waged war against Japan. Once the U.S. recognized the danger, the policy was to stop supplying Japan with the resources it needed to commit its crimes against humanity. To achieve this, an embargo was imposed, but the effect was the opposite of what had been hoped for. Instead of ceasing its aggressions, the Japanese bombed Pearl Harbor. Today, we face a powerful, rising nation, a dictatorship called China. Its stated intention is to surpass the U.S. as a world power. Its likely aim is to subjugate the U.S. and, by extension, the entire world. Instead of overt military invasions of their neighbors, the Chinese are using technology, economic ploys, and diplomacy to gain footholds inside the U.S. and other rival nations. In a sense, the Chinese are hijacking the American system, harnessing it for use against us. China has enlisted American corporations, politicians, and even public opinion to create a Trojan Horse effect inside our borders. It has sent spies in various disguises, ranging from low-level observers to high-profile executives, to steal our secrets, to insert malware into our computers, and even to sell us communications equipment designed to allow them to listen in.